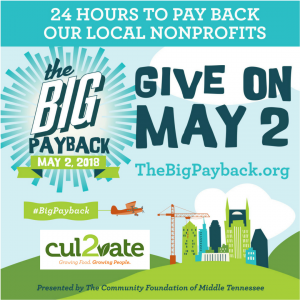 Cul2vate Participates in The Big Payback! As you know, Cul2vate feeds the hungry…those who are physically hungry due to the effects of poverty and those who are spiritually hungry for a fresh start. We grow nutritious food and put people to work, but we can’t do it alone. That’s why we’re excited to take part in “The Big Payback” on Wednesday, May 2! The Big Payback, hosted by The Community Foundation of Middle Tennessee, is a community-wide giving day that celebrates Middle Tennessee’s spirit of generosity and supports the life-changing work of area nonprofits, like Cul2vate. Kicking off at midnight on Wednesday, May 2, the 24-hour online giving day helps us raise much-needed funds and brings awareness to pressing needs in our community.Your gift of any amount during The Big Payback can be amplified by incentives and awards, and may help us qualify for special prizes and bonuses throughout the day. We hope you’ll take this opportunity to make a difference on May 2 – support Cul2vate and our mission to end hunger and provide training and employment assistance to those in need of a second chance. It’s a great way to begin #GrowingFoodGrowingPeople right here! For more information, contact us or visit www.TheBigPayback.org. You can find our page at www.TheBigPayback.org/Cul2vate Thank YOU for your support!